Tamil Nadu is southernmost of the 28 states of India and at the tip of the Indian Peninsula. Its capital is Chennai but you may be more familiar with its former name of Madras. 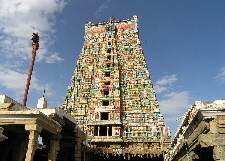 Tamil Nadu is famous for its monumental, ancient Hindu temples. 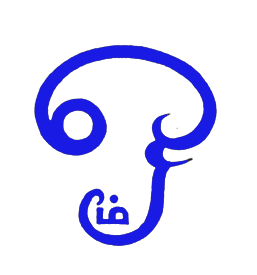 The District of Tindivanam in Tamil Nadu is ideal for growing indigo, as the climate is hot and humid, and indigo dye grown in this district has a reputation for superior quality. The indigo dye year starts in January, when seeds of Indigofera tinctoria are sown by hand in rich soil. Our suppliers are fourth generation indigo farmers, and they plant about 400 hectares with indigo dye, each hectare requiring 25 kilos of seeds. The indigo dye seeds germinate in 4 to 5 days and the plants grow very rapidly, so there is little need for weeding. No fertiliser is used in the indigo fields, as this plant belongs to the legume family and captures atmospheric nitrogen for its growth. Ninety days later, the indigo dye plants have grown into vigorous shrubs and are half a metre tall. It is now time for the first harvest to begin. 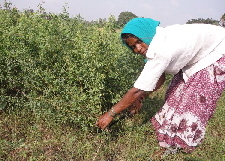 From 6 to 9 in the morning, women dressed in saris, cut the indigo plants with sickles, leaving about 10 cm of plant in the ground. The cut plants are gathered in bundles and placed in the back of a tractor which takes the freshly cut leaves to the processing plant nearby. The dye works consists of a low building surrounded by large concrete tanks, where the indigo pigment is extracted. By June, the indigo plants have re-grown and it is time for a second harvest and extraction. During September and October, and sometimes early November the indigo plants, which have been well watered by the monsoon, are ready for a third and final harvest. Not all the plants are harvested, some are left to flower to produce seeds for the following year. When the winter rains begin it is time to prepare the soil for another season. The indigo fields are planted close to where the indigo dye is extracted, as the indigo leaves must be as fresh as possible when they are processed to produce high quality indigo dye. As soon as the tractor loaded with indigo leaves arrives, workers place the freshly cut leaves in a concrete tank the size of a swimming pool (18 by 16 by 5 feet deep). They then press the leaves down with several long tree trunks placed side by side. Heavier trunks are placed on top at right angles. The trunks are kept under pressure by through pinioning the trunks with pegs in a series of holes in wooden posts. When all the trunks are in place, the tank is filled with water and the indigo is left overnight to ferment. The next morning, bluish green water is drained into a lower tank, which is the sedimentation tank. Two men filter the running water through a cloth to catch any stray leaves or branches. 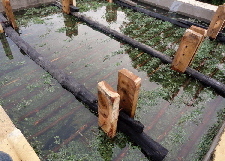 The spent indigo leaves in the first tank are taken out and returned to the soil. The water in the sedimentation tank now needs to be aerated for the indigo dye to become insoluble and to precipitate to the bottom of the tank. Four workmen stand in the pool and create turbulence by kicking their legs backwards for one or two hours. This action oxygenates the water as well as creating a great deal of blue foam which is periodically removed. When the foreman judges that the indigo dye is ready, the water is drained off and used to irrigate other crops. The thick blue sludge left in the bottom of the tank is collected and taken to a copper pan where it is heated so some of the water be can evaporated off. 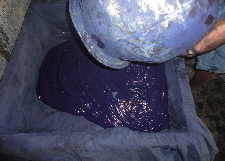 The concentrated indigo paste if filtered through a cloth, poured into a mould and left to dry in the shade. 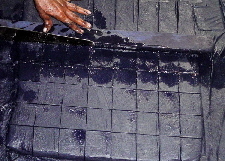 When dry, the indigo dye is cut into ‘cakes’ roughly 5 cm square and 2 to 3 cm thick. It takes another three weeks for the cakes to become completely dry and they are then ground into indigo dye powder.